Power output of a wind turbine rises as the cube of wind speed. Wind turbines operate within a narrow range of wind speeds – if the wind is too slow, the turbine won’t turn, and if it’s too fast, the turbine will shed the wind rather than risk damage to the turbine. Wind speeds of over 6.5 meters per second are typically necessary for economic wind energy generation. Several factors can affect the amount of power a turbine can generate. Wind speeds increase as height above the ground increases – this is the main reason why commercial scale wind turbines have increased in height over the past twenty years. Wind energy production is negatively affected by roughness of terrain and the resulting turbulence – another reason that wind turbines have increased in height. The wind in any given location does not blow constantly, at the same speed, or from the same direction. The seasonal and daily variations can be to a certain extent absorbed by the electrical grid, but as the percentage of wind power on the grid increases, the variability will have to be managed. 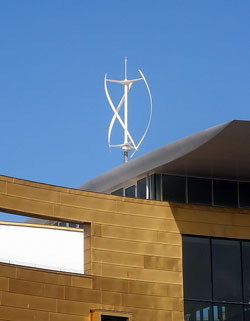 Modern wind turbines come in a variety of styles and sizes, depending on their intended use. The most common style is the horizontal axis turbine, where the axis of the blades is parallel to the ground. 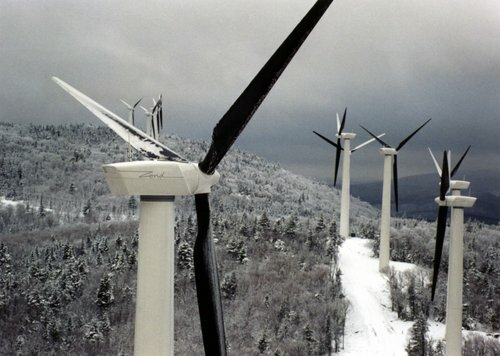 Less common are vertical axis turbines, where the axis of the blades is perpendicular to the ground. Turbines range in size from small turbines (50 watt – 250 kilowatt) designed for residences, boats, and off-grid applications to large scale commercial turbines – anywhere from 250 kilowatts to 3.5 or 5 megawatts. The “nameplate” capacity of a turbine such as quoted above refers to the maximum theoretical production of the turbine.